Family Donates Memorabilia to Royal Military College of Canada | Centre-Arch Inc. Early this morning, on the grounds of the Royal Military College of Canada at Kingston, Ontario, as the activities of the annual Ex-Cadet Weekend were unfolding, a historic event, years in the making, transpired in the historic Mackenzie Building, beside the Memorial Staircase and across from the College Sergeant Major’s office – a ceremony that is a continuation of the College Chief Warrant Officer (CCWO) Project – as the display case received its first items recognizing the contribution of RSM (WO1) JJT McManus, CD, Cdn Guards, the College Sergeant Major (the position is now known as CCWO) from 1961 to 1971. Medals and decorations awarded to RSM (WO1) McManus, CD include (l to r):1939-1945 Star, France & Germany Star, The Defence Medal, Canadian Volunteer Service Medal with clasp, The War Medal, Canadian Korea Medal, Canadian Volunteer Medal for Korea, UN Service Medal (Korea), Queen Elizabeth Coronation Medal (1953), Canadian Centennial Medal (1967), Efficiency Medal and Canadian Forces Decoration with 2nd clasp. The commemorative board listing the names of all College Sergeants Major/College Chief Warrant Officers. 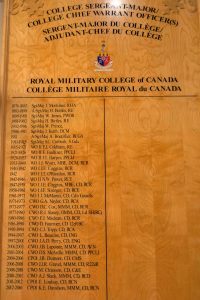 The board is beside the Memorial Staircase in the Mackenzie Building at RMCC. 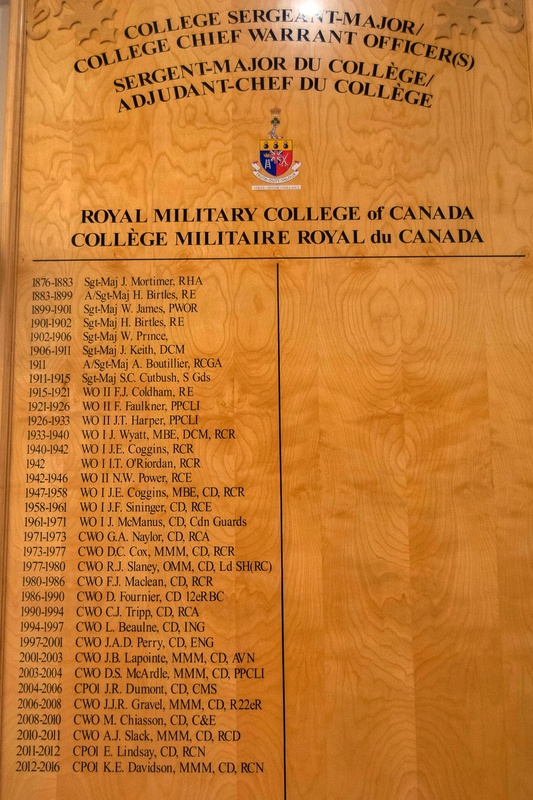 One of the projects to mark the 100th Anniversary of the founding of the RMCC Club was to install a board that would record the names of the RSMs who have trained the cadets down through the years. Ex-cadets would thus acknowledge the debt of gratitude that they owe these extraordinary warrant officers who did so much to inspire in them a love of military life and imbue them with the paramount need for the pursuit of excellence. Unfortunately, this project was never completed. Thirty seven years later, the RMCC Heritage and Museum Committee committed to continue the research necessary to complete this work. Thanks to the committee members, most notable, MGen (Retired) Frank Norman, secretary, Mrs. Lena Beliveau, Mr. Ross McKenzie (past) museum curator, Major Mathias Joost, Directorate of History and Heritage (DND), CPO1 (Retired) Keith Davidson and many others, the recognition board of RMCC Sergeants-Major and Chief Warrant Officers is now completed and a display case has been installed. The military career of RSM McManus started in 1937 with the Cameron Highlanders of Ottawa (M.G.). Serving with the Regiment in World War II, he became one of the Canadian Army’s youngest RSMs at the age of twenty-four. Upon joining the Canadian Interim Force as a WO2 at the conclusion of hostilities in 1946, RSM McManus joined the Royal Canadian Regiment and was subsequently appointed as the first RSM of the 2nd Battalion of the Royal Canadian Regiment in 1950, and served in Korea. He was also appointed the Regular Force Sergeant Major of the Canadian Army Contingent to the Coronation of Queen Elizabeth II in 1953. In 1954, RSM McManus was appointed the Regimental Sergeant Major of the Depot at Petawawa for the newly-formed Regiment of Canadian Guards, where his earlier nickname of “Rocky” changed to a title – “The Rock”. It was from the Guards Depot that RSM McManus arrived at the Royal Military College in June, 1961. In retirement from the Regular Army as Chief Warrant Officer in June, 1971, Mr. McManus continued his dedication to military service as a captain in the Reserve Force, commanding the Royal Canadian Army Cadet Corps Number 113, sponsored by and associated with The Brockville Rifles, the local reserve regiment. 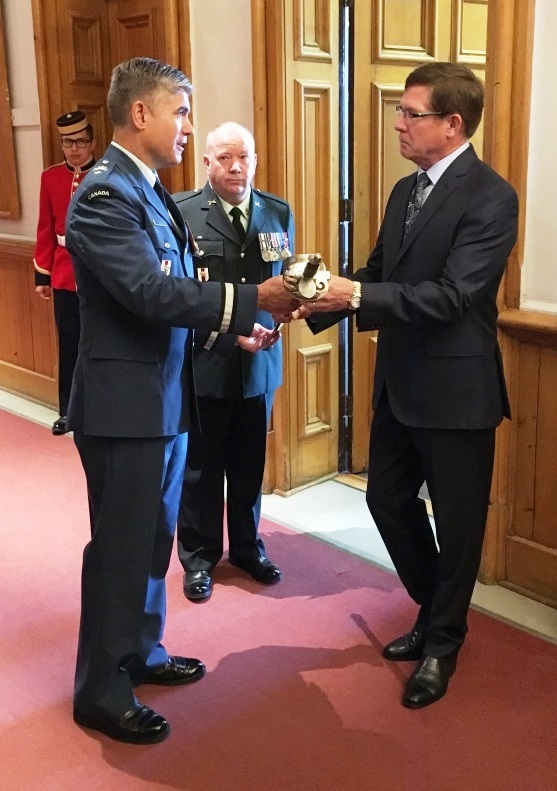 Antony McManus, one of the twin sons of RSM (WO1) JJT McManus, CD, presents his Father’s Canadian Guards Regimental Ceremonial Sword to RMCC Commandant, Brigadier-General Sean Friday, OMM, MSM, CD. College Chief Warrant Officer, Garth Hoegi, MMM, CD looks on. Second year Officer Cadet Pablo Cardona is in the background. The sword will be placed in a display case beside the Memorial Staircase in the Mackenzie Building at RMCC. 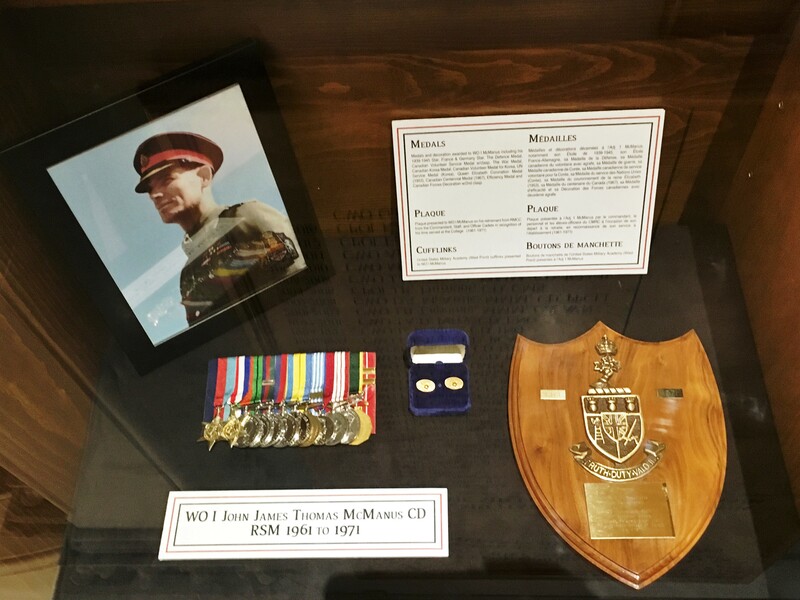 On this 2016 Ex-Cadet Weekend, the next phase of the CCWO Project came to fruition as the display case received its first items recognizing RSM JJT McManus. The McManus Family presented his Regiment of Canadian Guards ceremonial sword, along with his career medals & decorations and other military memorabilia related to RMCC. These included the plaque RSM McManus received in 1971 upon leaving the College (and his retirement from the Canadian Armed Forces after 33 years of service), as well as 18K gold West Point crested cuff-links that had been a gift from his counterpart, United States Military Academy (West Point) CSM Kazmerzak, during one of the annual RMCC – West Point weekends. The Guards sword had been a gift to RSM McManus from the Regimental Officers upon his departure from the Canadian Guards Depot in 1961. Ten members of the McManus Family were present for the ceremony. On hand to receive the donation on behalf of RMCC were the Commandant, Brigadier-General S. G. (Sean) Friday, OMM, MSM, CD; the College Chief Warrant Officer, CWO Garth Hoegi, MMM, CD; the Training Wing Sergeant Major, MWO Rideout, MMM, CD; Warrant Officer Chuck Ansell, CD; and four members of the Cadet Wing – Officer Cadet (II) Pablo Cardona, Chief Correspondent to e-Veritas, the RMCC Club newsletter; Officer Cadet (III) J. E. Scott Howells, e-Veritas Photographer; Naval Cadet (IV) Mackenzie Labrecque and Officer Cadet (IV) Brianna Kelly, the Commandant’s aides-de-camp. During the ceremony, Antony McManus, the youngest son of RSM McManus, who spent the majority of his Canadian Federal Civil Service career in defence procurement, addressed the gathering prior to officially making the donations to the College on behalf of the Family. Antony shared a few recollections of his Father’s time at the College, and he noted that although RSM McManus was never one to seek out recognition, he is sure his Father would have supported the donation. (L to R) Front Row: CWO Garth Hoegi, MMM, CD, Antony McManus (son), Darah DeJeet (step-granddaughter), Mrs. Sylvia McManus (spouse of RSM (WO1) JJT McManus, CD), Rachael McManus (granddaughter), Mrs. Odette McManus (spouse of Mark McManus), Brigadier-General Sean Friday, OMM, MSM, CD, Officer Cadet (IV) Brianna Kelly. (L to R) Back Row: Naval Cadet (IV) Mackenzie Labrecque, Mark McManus (son), Wesley DeJeet (step-son), Jordan McManus (grandson), Mrs. Louise Clouâtre (spouse of Antony McManus), Justin McManus (grandson), MWO Wally Rideout, MMM, CD, and Warrant Officer Chuck Ansell, CD. Brigadier-General Friday was extremely appreciative of the donation to the College, noting the “understandable emotion in the room” and reflecting upon the “significant contribution the College Sergeant Major makes to the life of the College” in general and the development of the officer cadets in particular – a contribution that often lasts throughout the cadets’ military career and lifetime.